Backstage has been the #1 career resource for actors and performers since 1960. They are now an online subscription service, but still have bi-weekly issues of their popular magazine on the shelves. Our goal was to provide an easy way for actors to sift through casting calls, apply to roles, and send messages - whether they are running to their next audition or multitasking on the couch. The app, like Backstage's other services, needed to inspire users, while providing a pragmatic solution, to take actions towards their career. How are actors searching & applying to casting calls when not near a computer? Our process began by reviewing website data conclusions and bringing in aspiring actors to tell us about their experience with Backstage. We wanted to naturally draw out their feelings on the website and how likely they are to apply to jobs on their phones. It provided us with valuable information for our app, as well as for our current website and how we can improve Backstage as a whole. We also reached out to our users online through a survey that helped us tie up loose ends and unanswered questions. 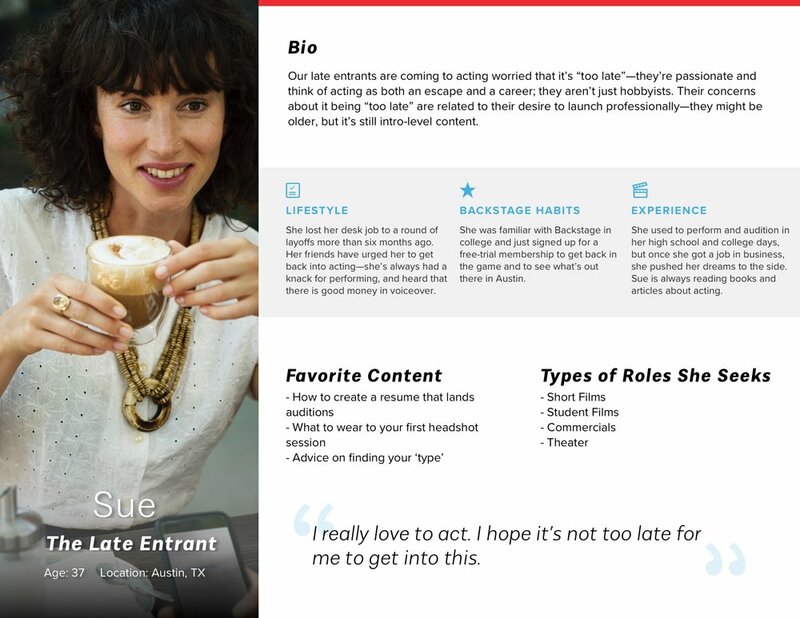 After interviewing actors and performers, the team was able to break out characteristics and themes into user personas. These persona cards have been a valuable source in other aspects of Backstage's business. The many team workshops involved whiteboard note-taking, arranging post-its, sketches, and determining our user flows. Co-workers in marketing, engineering, and design all took a marker and drew what we imagined for initial app screens. It was a great way to get ideas flowing and to open everyone's thoughts through a round of critiques. As a designer on this project, it gave us a rough outline of features to start with. wait a second, what is that? When I have my phone and I'm open to seeking work, I want to efficiently find, choose, land and prepare for auditions that are right for me, and maintain communication, so I can progress in my career, build visibility, expand my network, get cast, and be a successful actor. The whiteboard served as our canvas for my design team, which helped us lay out our ideas and begin wireframing. We started with our main Casting Calls page, which included streamlining our filters and saved search flow for our users. The user interface mirror the colors and branding of our site, while elevating the cleanliness with sharp contrasts and clever interactions. We wanted to improve our users' ability to swiftly search and apply to roles in style. To address conflicts and demonstrate our ideas, I prototyped different solutions for quickly revealing roles to our users. We decided on a swipe to reveal roles motion, as seen below. I develop custom imagery for Backstage's brand and implement them into the app. - Clear, honest and inspiring illustrations convey trust. - The introductory slideshow below replaced stock imagery that was previously there in version 1. The Backstage iOS app proved to be successful as the business saw a 5% increase in subscriptions through the app over the past year, received glowing reviews in the app store (4.8 stars / 2.5k reviews), and noticed an increase in quality application submissions. The Backstage audience grew as more actors discovered the product through the appstore.